Gender has increasingly become a part of the international peace and security agenda, particularly since the passage of UN Security Council Resolution (UNSCR) 1325 and subsequent resolutions on women, peace and security. Yet little attention has been given to examining how the resources and political will generated by the post-2015 framework could help move this agenda forward. 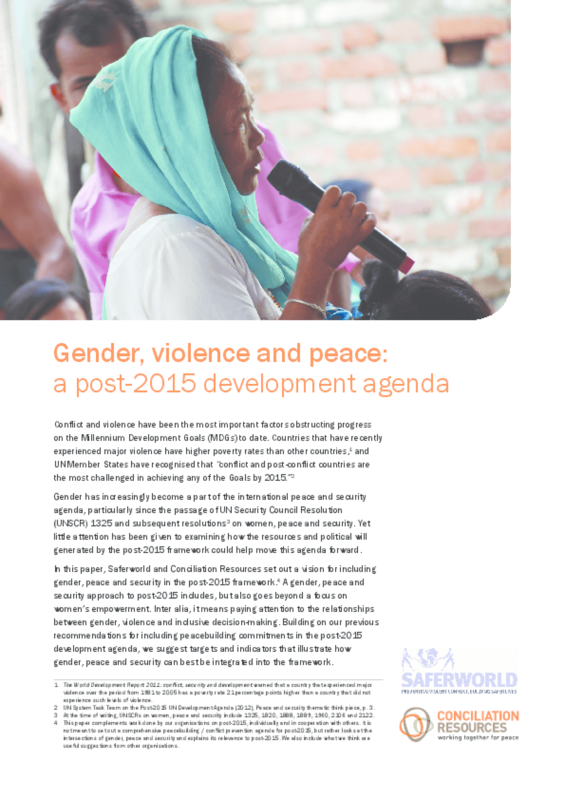 In this paper, Saferworld and Conciliation Resources set out a vision for including gender, peace and security in the post-2015 framework. A gender, peace and security approach to post-2015 includes, but also goes beyond a focus on women's empowerment. Inter alia, it means paying attention to the relationships between gender, violence and inclusive decision-making. Building on our previous recommendations for including peacebuilding commitments in the post-2015 development agenda, we suggest targets and indicators that illustrate how gender, peace and security can best be integrated into the framework. Copyright 2014 Conciliation Resources, Saferworld.